Every journalist deserves to get paid for bringing new information to the public. Especially those who face direct opposition from foreign military regimes. This morning I heard an NPR piece titled ‘Bureau Tehran,’ Live From Massachusetts. The subject of the story was Iranian journalist Kelly Golnoush Niknejad, who runs her news site Tehran Bureau from her family’s living room in Newton, a small suburb of Boston. The story opens a new window to an area of journalism that’s quickly growing: International reporting on a do-it-yourself level. 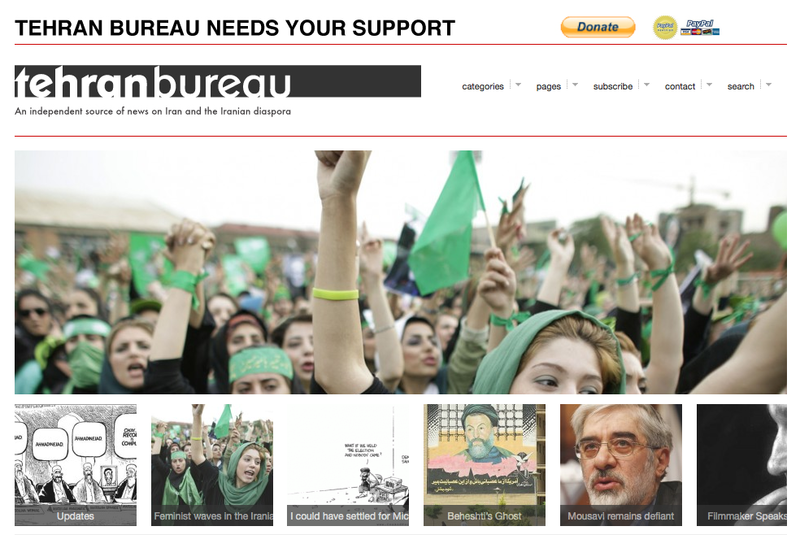 For most of her updates on what’s occuring in Iran, Niknehjad uses two laptops and often relies on emails from “contributors of Iranian descent, both in and out of the country.” As of now, those contributors provide her with information for free, and typically avoid taking bylines. According to the NPR piece, Niknehjad started Tehran Bureau seven months ago and within the past few days her audience has grown from about 9,000 to 19,000. When I heard that I immediately thought of how blogging and twitter have become vital outlets for free speech in a country confined by religious despotism, political injustice and information censorship. So, I contacted Niknejad about her recent interview and asked her if she would be able to talk about the dollar/rial value she places on her and her colleagues’ coverage, especially while Iran remains conflicted and without a free press. “Right now we have about 20,000 people following our coverage on twitter alone,” she adds. “If every one of those readers donated $5, we would have enough money for a full year’s budget.